Quite a few interesting results came through over the weekend from the world of cycle racing: Fabio Aru won the Vuelta a Espana. He has probably got nearer than anyone else this year to doing a grand tour double after having finished in second place at the Giro d'Italia in May. Edvald Boasson-Hagen won the Tour of Britain, making him the first person to win the stage race twice in its modern era. La Vuelta became the second of the grand tours to stage a women-only race on the final day of the competition. Yesterday's race held on the windswept roads of Madrid was won by Ale Cipollini rider, Shelley Olds. It was great to see all of these events on TV. Another American made history across the Atlantic, though this piece of history has gone somewhat under the radar though. 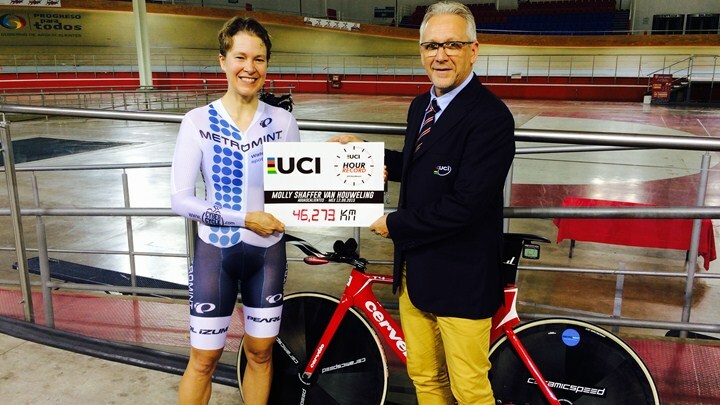 A new Women's World Hour Record was set over the weekend by the Molly Shaffer Van Houweling at the velodrome in Aguascalientes, Mexico. Ever since Jens Voigt reignited the competition by breaking the hour record almost a year ago to the day, the quest has rolled on in earnest amongst the male gladiators of cycle sport. Things have been a lot quieter on the women's front however, with no one apart from Dame Sarah Storey attempting to break Leontien van Moorsel's 12-year old record. I rember that Saturday afternoon in February in a crowded velodrome at Lee Valley, London, watching in hope as Sarah battled her way around the track only to fall short of the 46.065km hour record by two laps. Meanwhile, in Mexico Van Houweling was beavering away in the background making her bid for perfect-hour glory by breaking the US Women's hour record. The 42-year old law professor from the University of California, Berkeley, eventually broke the world hour record in July when she clocked 46.088km. However, this record could not stand as she had not been registered onto the biological passport programme for long enough for her time to qualify. But on Saturday night, all the stars were aligned for Molly Shaffer Van Houweling to put her day job behind her, take to the boards again - and clock 46.273km. Boom! Now I think that's worth writing about! I don't imagine this will get the column inches that Bradley Wiggins had when he broke the record, but I do hope a few more people shout about it. 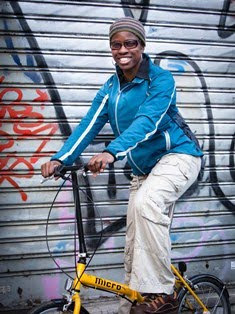 I also hope that more women step forward - maybe Dame Sarah Storey will make another attempt, or maybe world time trial champion Lisa Brennauer will try it or even other home girls like Joanna Rowsell or Katie Archibald. It would be good to see the women's hour record chased with the same zeal as on the men's side. Very nicely written post, with lots of great detail and thoughts of a set of significant events. Some unique points made too! Thanks for the comment Kiat. I was just pleased to see another woman go for the hour record - and she's inspirational too.